The sonic spectrum of 45 years of synthesizer-history makes TITAN 2 an instrument that is unmatched and unique in diversity. "This is truly a bottomless ocean of sound"
The developers faced the challenge of preserving the incomparable character of the original instruments, yet enabling the creation of individual and entirely new soundscapes with TITAN 2. 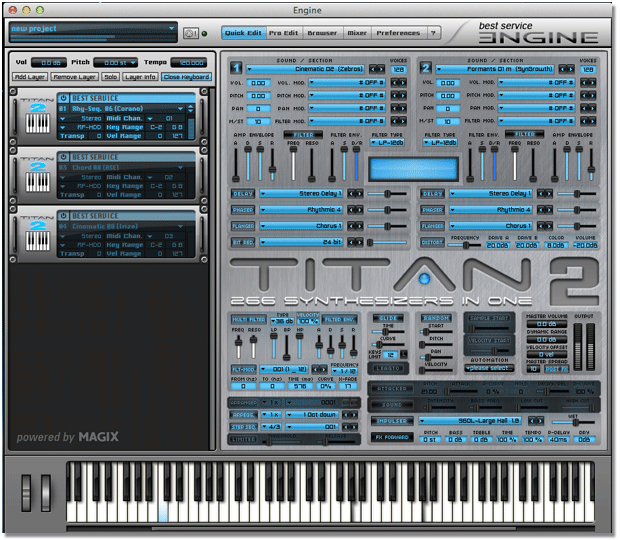 TITAN 2 comes with a gigantic library of 12,800 presets. 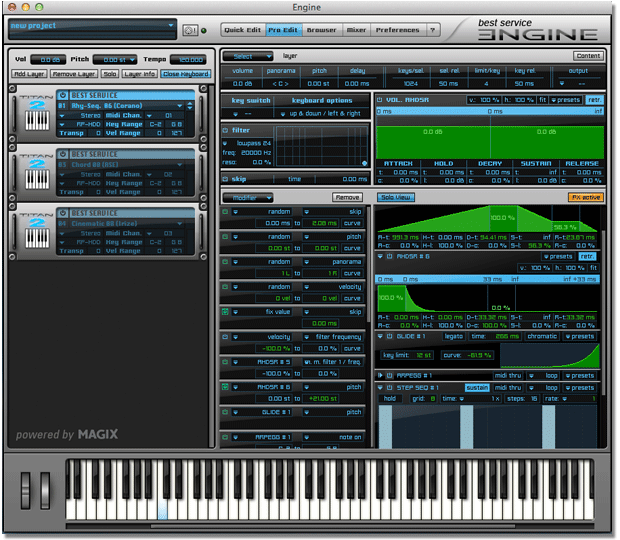 Besides basses, leads and pads, the new version offers various sounds designed for current dance productions. TITAN 2 does not simply offer sounds of current famous synthesizers, but is actually able to often replace these instruments – thanks to its carefully reproduced wave forms and elaborated edit-functions. Because of the enormous bandwidth of synthesizers being used, TITAN 2 offers an unbelievable broad palette of sonic characters. However, TITAN 2 does not solely define itself by the sonic sources but by the presets being carved from these. TITAN 2's user-interface was completely redesigned. It now allows immediate access to almost every parameter. Even when producing under pressure of time, you will be able to use TITAN 2's full functional range without getting lost in countless menus or subpages. TITAN 2 contains the full content of TITAN 1. The former was focused on classic hardware-synthesizers while the new version completes this large sonic choice with sounds targeting current dance- and pop-genres/productions as well as film and video-scoring. Among others, TITAN 2 includes the fattest super-saw leads available, Dubstep-sounds for EDM-genres, cinematic-, orchestral- and natural-sounds as well as various electronic classics. Also, the original 5,500 sounds of TITAN 1 can now be tweaked, modulated and mixed more detailedly and effectively using TITAN 2's revamped user-interface. It took more than 15 years and one of the largest private synthesizer-collections to realise the recordings of TITAN 1 and 2. The complete sound-library consists of over 11,000 synthesizer-multisamples and approximately 200,000 single samples. In addition, 1,800 up-to-date drum- and effect-sounds are offered, that were created independently and not just taken from the library’s synthesizers. To achieve best possible results, the multisampled instruments often contain fully recorded filter sweeps, multiple dynamic layers as well as up to 61 key zones. Almost every single sample was made inaudibly loopable with greatest care. The library's sample-content comprises a massive 80GB. Thanks to inaudible data-compression, this amount was reduced to a friendly amount of approximately 25GB on your hard-drive. At the same time, loading times for presets were significantly sped up and will, at the most, take one second – no matter what size. Titan 2 punktet mit einer enormen Vielfalt inspirierender und ausdrucksstarker Klänge zwischen Vintage und futuristisch in guter Audioqualität. In Anbetracht dieser Stärken schaut man wohlwollend über die genannten Schwächen hinweg. Ob Sie die Sounds analoger Legenden, Modularsysteme, digitaler Klassiker oder moderner Workstations und Software-Klangerzeuger suchen: In Titan 2 werden Sie sicher fündig. Positiv hervorzuheben sind ferner die geringe CPU-Last sowie die erfreulich kurzen Ladezeiten. The sounds are very very diverse. The samples are focused on the specialties of each synth. For example Massif got a lot of Dubstep Wobbles and Osphere got a lot of epic voice sounds. All sounds seem to be recorded & looped with a lot of attention to the detail. I never came across a part where it bugged me that it is looped sounds instead of live synthesis. Also dynamics and filters were recorded, which really helps to forget you are dealing with a sample instrument. On top, you can add a couple of nice fx including the well known Origami reverb. What makes this synth outstanding and highly usable are the very short loading times. Best service kept there promise that each patch will load in under a second. You can easily browse through the sounds without waiting ever to hear the selected file. Wonder how they do that. The categories help with finding, what you are searching for. Almost everyone can make use of this synth. Every song that is in need for a synth will profit from the treasures of Titan 2. One type of user should especially find Titan 2 of benefit. If you are a composer/producer who likes to work quickly to get rough sketches down and then later go back for clean-up and polishing, Titan 2 could be your secret weapon. Such a quantity and diversity of sounds in one place, all rather nicely, efficiently organized, might allow you to never have an inspiration blocked while you interrupt the creative flow to search for an appropriate synth and sound. Titan 2 is a massive palette of sounds all ready for to dip your composer’s brush into. Best Service TITAN 2 ist eine gelungene Sammlung mit im Producer-Alltag immer einsetzbaren Sounds. Im direkten Vergleich – ich habe einige der simulierten Synths als Originale im Schrank oder im Plugin-Ordner – kann TITAN 2 natürlich nur bis zu einem gewissen Punkt mithalten. Da kommt die Klangerzeugung mit datenreduzierten Samples und Bearbeitungsparametern, die alle Synths unter einen Hut bringen muss, irgendwann an ihre Grenzen, auch wenn man mit dem ogg-Format sicher einen guten Kompromiss gefunden hat. Hier wird simuliert, nicht emuliert – und das sehr gut. Und an Klangvielfalt ist dieses Plugin derzeit wohl nicht zu toppen. Wer eine Vielzahl an Sounds mit unterschiedlichstem Klangcharakter sucht und wem das Song-Ergebnis wichtiger als das Handanlegen an jeden Sound-Parameter ist, der ist bei Best Service TITAN 2 genau richtig. Für 199,– Euro bekommt man jedenfalls ein sehr umfangreiches Klangpaket. Excerpt: So what’s the bottom line? If you’re one of those people who get inspired by new sounds and need a constant influx of new content, you will not be disappointed with this one at all. I give TITAN 2 A 4 out of 5 subs, there’s just so much content in here, with so much variety, there’s definitely something for everybody. Now if you’re someone that really likes to get down and dirty tweaking your synths, I find this interface a little too small, it really seems to be setup for quick tweaking and adjusting as opposed to deep synthesis work. Of course it could be preference…my eyes aren’t what they used to be, but I did find it a tad small. ... I find this to be a great value for the price, not to mention the included impulse reverb which sounds great. All in all, if you need a huge collection of synth sounds and don’t want to go out and purchase every single synth available, do yourself a favor and check this out. Der Klang von TITAN 2 ist gut und die klanglichen Möglichkeiten sind gigantisch, so ist es möglich schon in nur einem Engine Layer bereits zwei Synthesizer Sounds zu verwenden, welche dann auch noch unabhängig voneinander bearbeitet werden können, in ENGINE können dann wiederum mehrere dieser Einzellayer übereinandergelegt werden. Meiner Ansicht nach ist TITAN 2 für den geforderten Preis von 199,- Euro extrem preiswert, wer einmal nachrechnet was alleine die Synthesizer Plugins aus TITAN 2 in der Summe kosten würden, von den Hardware Synths will ich hier gar nicht erst anfangen, der weiß, was ich mit extrem preiswert meine. Die Titan 2 Synthesizer Library von Best Service ist die größte Ansammlung von Synths und Presets, die ich kenne. Wer eine gut klingende Synth Sammlung auf dem Rechner haben will, kommt an Titan 2 eigentlich nicht vorbei. Klanglich wird alles abgedeckt, vom 70er Synth Pop, bis zum modernen Dub Step. Die von Best Service versprochene, minimale Ladezeit wird eingehalten. Dank der vielen Einstellungen holt man aus den Synths und Pads mehr heraus, als die Originale zu bieten hatten. Wollte man sich die enthaltenen Synths zulegen, wäre man ganz schnell im 6stelligen Euro Bereich. So gibt es die Software für angenehme 199,- Euro. This VST is a must for anyone that’s trying to upgrade their sound library BIG TIME! If I lived to be 100 years old, I don't think I would have time to use all of the permutations of sounds in Titan 2. What will Titan 3 bring !! !